For an office that does not offer catalog-listed courses, the Oral History Center is still deeply invested in — and engaged with — the teaching mission of the university. In 2015 we launched the Introduction to Oral History Workshop, which was created with the novice oral historian in mind, or individuals who simply wanted to learn a bit more about the methodology but didn’t necessarily have a big project to undertake. Since then, a diverse group of undergraduate students, attorneys, authors, psychologists, genealogists, park rangers, and more have attended the annual workshop. This year’s workshop will be held on Saturday February 3rd and registration is now open. In addition to these formal, regularly scheduled events, OHC historians and staff often speak to community organizations, local historical societies, student groups, and undergraduate and graduate research seminars. If you’d like to learn more about what we do at the Center and about oral history in general, please drop us a note! 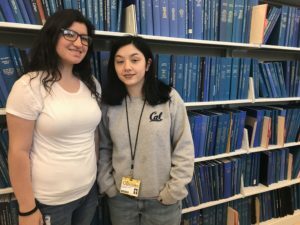 In recent years we have had the opportunity to work closely with a small group of Berkeley undergrads: our student employees. Although the Center has employed students for many decades, only in the past few years have they come to play such an integral role in and make such important contributions to our core activities. Students assist with the production of transcripts, including entering narrator corrections and writing tables of contents; they work alongside David Dunham, our lead technologist, in creating metadata for interviews and editing oral history audio and video; and they partner with interviewers to conduct background research into our narrators and the topics we interview them about. With these contributions, students have helped the Center in very real, measurable ways, most importantly by enabling an increase in productivity: the past few years have been some of the most productive in terms of hours of interviews conducted in the Center’s history. We also like to think that by providing students with intellectually challenging, real-world assignments, we are contributing to their overall educational experience too. As 2017 draws to a close, I join my Oral History Center colleagues Paul Burnett, David Dunham, Shanna Farrell, and Todd Holmes in thanking our amazing student employees: Aamna Haq, Carla Palassian, Hailie O’Bryan, Maggie Deng (who wrote her first contribution to our newsletter this issue), Nidah Khalid, Pilar Montenegro, Vincent Tran, and Marisa Uribe! Are you an undergraduate student who is curious about the research process? Would you like to hear about the experience of one of your peers? Join us Wednesday, November 8th for a talk by Gabriella Wellons, undergraduate in Art History. During her summer travel to north coastal Peru, UC Berkeley senior Gabriella Wellons created a graphic record of graffiti at the Huacas de Moche archaeological complex, the site of a former urban and religious center with two monuments (Huaca del Sol y Huaca de la Luna), located within the Moche Valley. 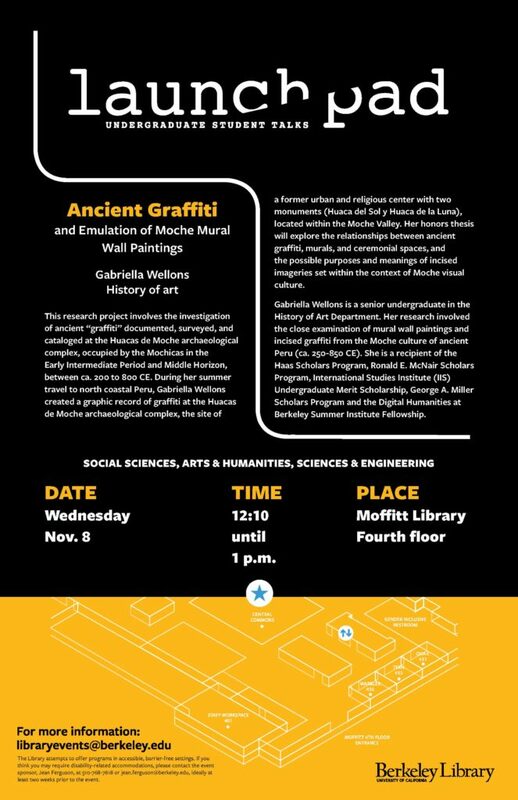 Her honors thesis will explore the relationships between ancient graffiti, murals, and ceremonial spaces, and the possible purposes and meanings of incised imageries set within the context of Moche visual culture. Gabriella is a recipient of the Haas Scholars Program, Ronald E. McNair Scholars Program, International Studies Institute (IIS) Undergraduate Merit Scholarship, George A. Miller Scholars Program and the Digital Humanities at Berkeley Summer Institute Fellowship.